During the annual Durga Puja Festival honoring the Hindu goddess Durga,Kolkata is transformed into a gala street festival. Ornate 8 armed clay figurines are displayed in open air communal locations. Photographing Hindu priests reciting prayers. locals bringing anjali's (offerings), dancers and musicians all electrify India's third largest city. On this intensive photographic tour we will immerse ourselves in the City of Joy photographing the heritage neighborhood populated with decaying mansions, the blue painted walls in the 350 year old bazaar neighborhoods and feast on East Bengal cuisine. We will be lodged for 6 days in a centrally located Kolkata hotel which affords us the opportunity to wander and capture images of rickshaw pullers, yellow Ambassador taxis and the magic of the Durga Puja festival. This gritty city has wonderful architecture dating from its past as the home of the East India trading company and British rule, a flower market that rivals none in India and Durga Puja is a time when Kolkata is at its friendliest to travelers/photographers. Varansi, the oldest living city in the world is the place to capture images of the Dushera and Bharat Milip Hindu festivates. Dushera represents good over evil. Each year on Dussehra, colorful effigies of demon king Ravan are burned to mark the defeat of Ravan by Lord Rama. Leading down to the ghats a massive statue of Raven is carried through the center of town with Varanasi city dwellers and pilgrims singing hymns and chanting. Once at the Ganges it is lit afire and firecrackers will shriek in the air. Women will fill clay pots, (diyas) with oil and send them adrift. The following day is Bharat Milip and Varansi comes squanch again. 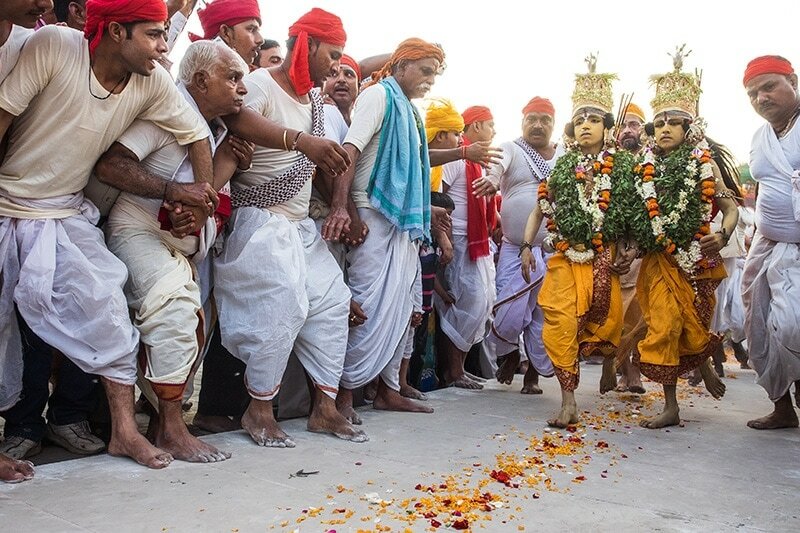 The people of Varanasi celebrate Bharat Milap with great fanfare and devotion. Thousands gather in the streets to see the procession of Lord Ram and his reunion with younger brother, Bharat. People pay their respect by putting tilak on forehead and garlanding Lord Ram and his brothers. Another interesting part of the Bharat Milap celebration is the presence of Kashi Naresh (former king of Varanasi) with all his royal paraphernalia and regal finery. Special devotional prayers are said at the numerous iconic Hindu temples in Varanasi. After breakfast we will start our photo tour by taking a tram ride around the city. Kolkata still has a street car line that transverses the city from which we can shoot the wide boulevards, yellow Ambassador taxi's, colonial architecture as well as the crumbling buildings that make up this mosaic which is called the "City of Joy". The group will then photograph the vibrant Baghbazar and Sorabazar neighborhoods where the walls are painted blue, laundry is hanging from windows, people are praying in small Hindu temples where incense wafts from the windows. Early morning we will go to the Malik Ghat flower market which is adjacent to the Hoogli River. Near the southeast end of Howrah Bridge we will shoot the wholesellers as they arrive with huge consignments of flowers that are then auctioned to retailers. Many workers live in makeshift shacks, bathing in the river. At around 7am, local wrestlers practice their art on a small caged area of sand set slightly back from the river. Hopefully they will be there the day we shoot. Returning to the hotel for breakfast the group will be free until we go out in the later in the day. Immersing ourselves in Kolkata todays photographic activities will include documenting the last remaining rickshaw pullers in India, and the crumbling glories of this 350 year old city. These once glorious mansions have slipped into decay as the families could no longer take care of them. We will find a maze of beautiful and derelict 18th- and 19th-century mansions, built by former rajas and merchants, with blackened, weather-stained walls; intricate brickwork in Muslim, Hindu, and neoclassical styles; and colonnaded courtyards strangled by vines and other greenery. The most impressive of these is the Marble Palace, These relics will soon be gone as Kolkata modernizes. In the early morning we will take a boat ride on the ganges which is Varanasi's principle attraction. This spectacular 4km sweep of the ghat is best seen at dawn when the devotees come to pay homage to the sun god. Also passing the burning ghat where cremations are conducted is a unique sight for this those who have a desire for a spiritual experience. As so well said in the Lonely Planet guide; Varanasi is the India of your imagination. One of the most colorful and fascinating places on earth, surprises abound around every corner. Photograph the artisans as they construct massive clay effigies in the old Kumortuli section of Kolkata. Early morning shoot at Kolkata's wholesale 'phoolbajaar' or flower market right next to river Hooghly River. A myriad of scents, colors and commotion. Wander around Kolkata in the early evening and photograph the pandals (shrines) which display the Hindu deities. Photo walk in the historical neighborhoods where we will see decaying once elegant mansions and street life. In Varanasi we will photograph the parades and massive floats that are carried down to the Ganges during the Dusshera festval. 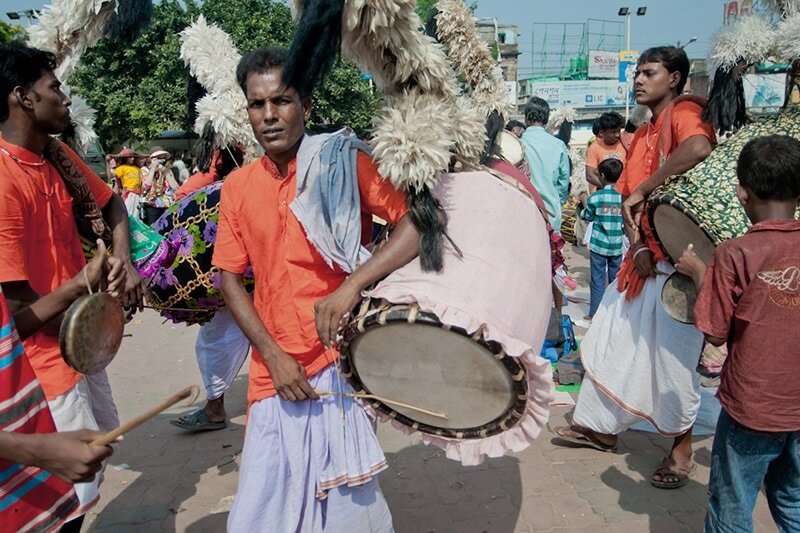 Wander the alleyways, ghats and photograph the Hindi pilgrims in the temples during the Bharat Millip festivities. The month of October is characterized by gradually falling daily high temperatures, with daily highs decreasing by 3°F, from 90°F to 87°F over the course of the month, and rarely exceeding 93°F or dropping below 84°F.